This gift is a whole lotta' fun. A snacker's dream and a perfect gift to share, our handsome, re-usable Jute & Cotton tote is loaded with sweet and savory treats from near and far. For our sweets fans, we've included Lemon Melts from Island Bakery Organics. This luscious cookie is handmade on the Isle of Mull from all organic ingredients - a crisp biscuit infused with lemon oil and dipped in white chocolate. Those who love chocolate and nuts will appreciate our Chocolate Nut Medley, crafted with creamy milk and rich dark chocolates luxuriously layered over whole macadamias, almonds, cashews, walnuts, and pecans. 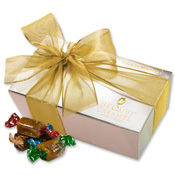 Slow simmered, handmade caramels from Montana's Bequet Confections are irresistible, and 20 pieces in assorted flavors are included here. Those whose tastes lean toward the savory side will appreciate a generous bag of Torres Black Truffle Potato Chips. Handcrafted in Spain, they are light and crispy with bold flavors. Anything goes with the plump, salted dipping pretzels from East Shore Specialty Foods, and one of our favorites is the devilish, distinct Raspberry Honey Mustard Pretzel Dip from Robert Rothschild. Popcorn lovers will enjoy large round popcorn perfectly popped then sweetened with Bourbon Smoked Sugar and finished with a sprinkling of Bourbon Smoked Togarashi, a Japanese spice blend containing chili pepper, orange peel, black & white sesame seeds, pepper, ginger, and nori. Three Jerks Jerky sets a new standard for deliciousness. The California-based company crafts their jerky from filet mignon for a refined, artisanal snack. When it comes to nuts and nut mixes, nobody does it quite like Fastachi. We've included a generous tin of Salt & Pepper Peanuts with just the right amount of heat to keep you reaching for more. 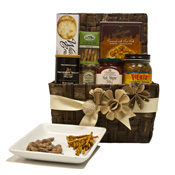 A bag of Mr. Filbert's French Rosemary Almonds, a crunchy, savory snack from the UK, complete the gift. Island Bakery Organics - Lemon Melts: From Scotland, a zesty lemon biscuit dipped in a sweet blanket of white chocolate. 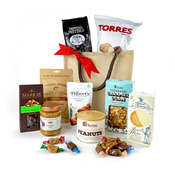 Marich Confectionery - Chocolate Nut Medley: Creamy milk and rich dark chocolates luxuriously layered over whole macadamias, almonds, cashews, walnuts, and pecans. Béquet Confections - Assorted Caramels: Handmade, award-winning caramels, made in Montana in flavors including Original Butter, Celtic Sea Salt, Salted Chocolate, Salted Mocha and Butterscotch. 20 caramels, 4 of each flavor. Torres - Black Truffle Potato Chips: A great tasting, gluten free snack, these light & crispy chips boast bold flavors. East Shore - Dipping Pretzels: Plump, salted pretzel sticks with a perfect crunch, ideal for dipping. Robert Rothschild - Raspberry Honey Mustard Pretzel Dip: A sweet & savory dip, ideal for dipping pretzels or as a glaze for poultry or pork. 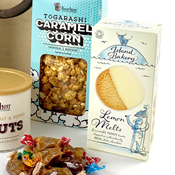 Bourbon Barrel Foods - Bourbon Smoked Togaraschi Caramel Corn: Crunchy, caramel-coated popcorn clusters spiced up for a deliciously harmonious bite. Three Jerks - Original Beef Jerky: Handcrafted from filet mignon for a tender, buttery jerky with a sweet & tangy flavor and just the right amount of black pepper. Bourbon Barrel Foods - Smoked Salt & Pepper Peanuts: Just the right amount of heat to keep you reaching for more! 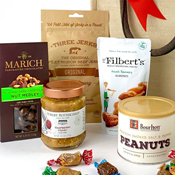 Mr. Filbert's _ French Rosemary Almonds:Tasty hot air roasted almonds are tumbled with fresh French rosemary and a touch of sea salt, providing a crunchy, savory snack.